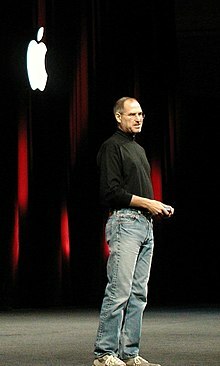 Steve Jobs, former chairman of Apple Inc.
A chairperson is a person who presides over meetings, such as a board of directors for a corporation, or any other meeting. The chairman of a corporation is not the chief executive officer, and only conducts the meetings in most companies. Although "chairman" has been used for both men and women, some prefer to use the terms "chairperson", "madame chairman" or "chairwoman." The conduct of meetings is governed by the organization's by-laws or charter, or, more formally, Parliamentary procedure for government organizations or large meetings generally. Rarely the chairperson is called the "chair," though in educational institutions a "chair" indicates a specific endowed position on a faculty. This page was last changed on 14 September 2015, at 08:49.